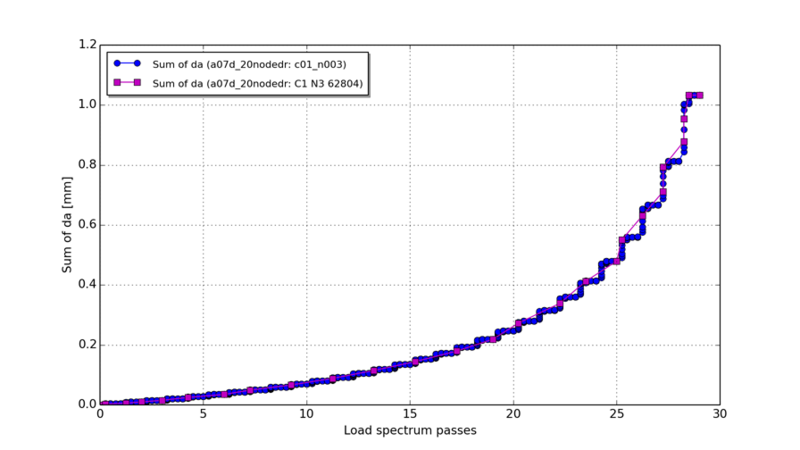 Output quantities through the load spectrum integration (summary or detail). Although these output tables can contain a large amount of data, it is important to note that the tables are present. In other words, manual effort is reduced considerably as a result of the automatic processing of the f.e. results by Zencrack. This is the case for analyses with or without crack growth. Information about the details of the integration process at one or more crack front nodes can be requested in the Zencrack input file. If such a request is made, the additional data is generated in separate output files, one per requested crack front node. This data can be used for plotting in the Zencrack GUI or imported directly into a spreadsheet. For the spreadsheet method a template file is provided to allow quick generation of key plots from this type of output file. If the detailed integration output is not requested, a coarser set of data at positions at which the f.e. analyses occur can be extracted from the main output file to produce xy plots. In the example shown here, the detailed integration output (blue line) can be seen to vary through the load history whereas the coarser f.e. data (magenta line) produces a less detailed "global" response. Crack growth profiles and crack surfaces can be visualised in the Zencrack GUI by import of the .vis analysis output file. XY plots can also be created from the analysis results. This is the fastest way to visualise the crack growth and to generate results plots. An alternative method is available which requires execution of additional post-processing utilities. These utilities are described on the post-processing utility page. In addition to the above, there will also be a requirement to post-process the finite element output files.